What does Dubai now have in common with the following cities: New York, Shanghai, Sydney, Singapore, Chicago, Limerick, Frankfurt, Tokyo, Austin, Paris, Washington, Bracknell and Sao Paolo? Give up? Well, today Dubai become the latest global city (the fourteenth in fact) to host a Dell Solution Center. These centers have proved instrumental in helping our customers explore, test and deploy end-to-end solutions that transform their business. Since opening our first center in 2011, we’ve completed more than 15,000 engagements globally. What I’m most proud of however is the consistently high level of customer satisfaction tied directly to the value of working with the Dell and solution center teams. I was delighted to be personally involved in the official opening ceremony at our new office in Dubai, along with Dave Brooke, Dell’s General Manager for the Middle East. The Middle East is a vibrant and technology-hungry region, with countries such as the United Arab Emirates (UAE) growing at a phenomenal rate. The launch of this center, the first in Dell’s EMEA emerging markets region, now gives our customers and partners across the Middle East – and indeed across the whole of our emerging markets region – access to an innovation hub connected to an entire global network. So if customers want to see solutions such as cloud computing, software, data center, security and mobility first-hand, they need look no further! 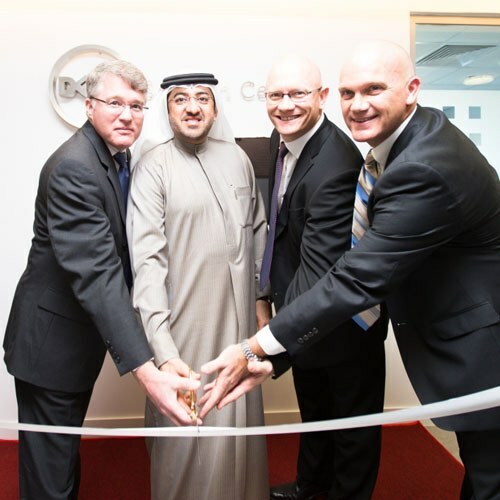 Today’s opening was a significant milestone for Dell in the Middle East and globally. Our special guest of honor was His Excellency Mohammed Ahmed Bin Abdul Aziz Al Shihhi, from the Ministry of Economy, UAE. I was impressed with what the Minister said on opening the centre. He talked about technology and innovation being two key pillars in the ongoing growth and evolution of the Middle East. He’s absolutely right and if we can help our customers continue to deliver better business outcomes in essential fields like education, healthcare and government through this new center, we’ll be playing our part in the continued growth and development of the region and its people.